Can I see macro targets per meal? I am following a migraine diet where I have to meet 60:20:20 macro targets in each meal. I can do it for breakfast as that is the first entry of the day, but for lunch and dinner it is cumulative, ie. it includes all the food of the day. Is there a possibility of grouping, so I can see if I meet the targets for breakfast, lunch and dinner separately? You can enable diary groups from the setting menu in the top right corner of the diary page. In your Diary Settings, tick the box next to Show Groups in Diary. You can edit your diary group names here too! With this feature enabled your can see the nutrient breakdown for any group by clicking on the group header in your diary. This will update the nutrient targets below to show you how much you are getting from the foods in that group only. Diary groups are available on the mobile app as well! Select the Profile tab, then Diary Settings. 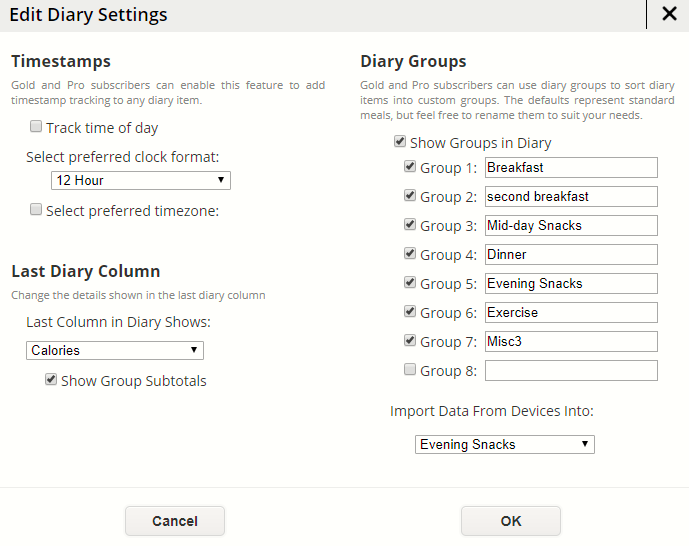 With a Gold subscription, you can Show Groups in Diary, edit the names and number of diary groups shown. There is an ad-free app for $2.99 which gives you the same features in the free account, without ads.